Twitter is a social media platform on which users post very brief messages that can be rapidly communicated across wide geographical areas and audiences. 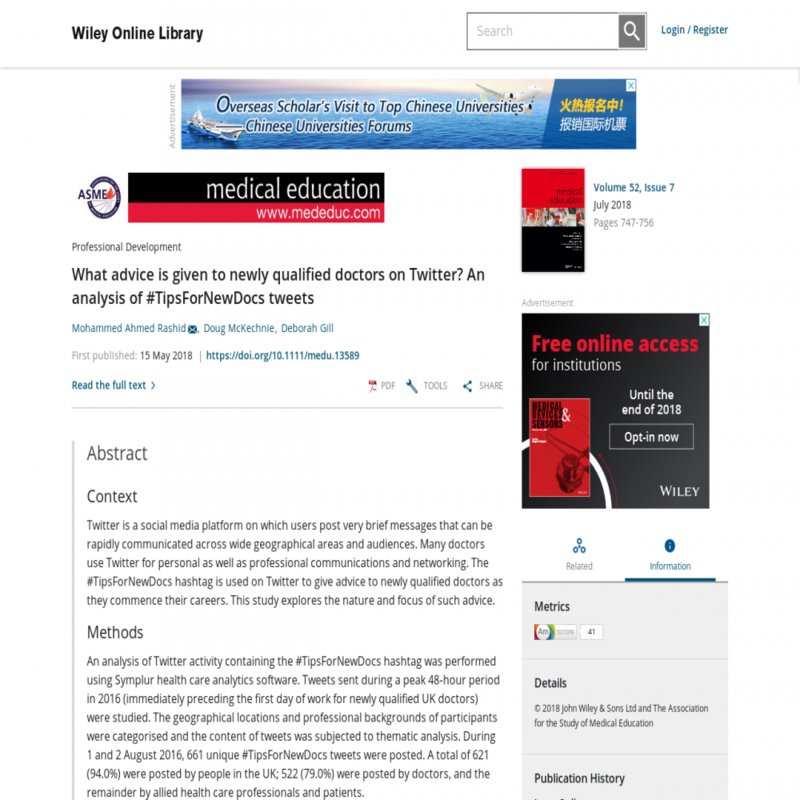 Many doctors use Twitter for personal as well as professional communications and networking. The #TipsForNewDocs hashtag is used on Twitter to give advice to newly qualified doctors as they commence their careers. This study explores the nature and focus of such advice. An analysis of Twitter activity containing the #TipsForNewDocs hashtag was performed using Symplur health care analytics software. Tweets sent during a peak 48-hour period in 2016 (immediately preceding the first day of work for newly qualified UK doctors) were studied. The geographical locations and professional backgrounds of participants were categorised and the content of tweets was subjected to thematic analysis. During 1 and 2 August 2016, 661 unique #TipsForNewDocs tweets were posted. A total of 621 (94.0%) were posted by people in the UK; 522 (79.0%) were posted by doctors, and the remainder by allied health care professionals and patients. The majority of included tweets focused on aspects of professional development, improving personal or professional knowledge, particularly tacit knowledge, and developing 'know-how'. These aspects of professional knowledge have previously been described as fundamental to professional education and training. However, a significant subset of tweets focused on accelerating socialisation into the profession, an essential step in joining a professional community. The tweets relating to socialisation were often humorous and colloquial in nature. Despite their brief and often jocular nature, #TipsForNewDocs tweets provided meaningful advice for newcomers to the profession, often focusing on tacit learning and professional socialisation. Hashtag-driven enquiries can be a valuable and time-efficient way of accessing and sharing tacitly held knowledge. Social media content analysis can provide valuable insights into key educational issues.